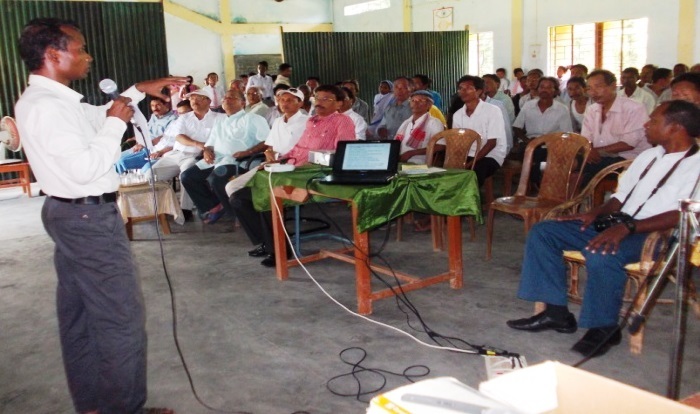 30th July, Sevakendra, Miao: Seva Kendra East Arunachal, the Social Service wing of Miao Diocese, launched FARM Northeast (Facilitating Agriculture Regeneration Measures) at Rajanagar under Bordumsa Circle of Changlang district. FARM is a community-led eco-friendly project, an effort by Seva Kendra to bring socioeconomic empowerment and to create food security by reviving traditional agricultural practices, which would be implemented in 10 selected villages of Miao and Bordumsa blocks. It also endeavors in creating networks between the farmers and government agencies so that they can benefit from available schemes and funds meant for them. Speaking on the occasion after officially launching the program, chief guest Kemto Riba, the ADC of Bordumsa lauded Seva Kendra for the effort and for wisely choosing the two blocks for the project. Stressing on the importance of sustainable farming system, he encouraged the farmers to go for multi-cropping and to implement new farming ideas in the field. Earlier, while welcoming the invited dignitaries and participants from the selected 20 villages, Sr. Rincy Kozhimala, Director Seva Kendra informed them that farmer–clubs will be formed in the proposed villages, which is a new concept for the area, and said that it will help in building better linkages with the government agencies. The programme was inaugurated and graced by Rt. Rev. George Pallamparambil, Bishop of Miao, Kemto Riba, the ADC of Bordumsa. The ZPM of Miao, Jawkhong Singpho, BDO Bordumsa, Tamo Riba and senior officials from Agriculture and Horticulture departments were also present for the event and they all greeted the project and the government officials were ready to cooperate to make it more successful. Mr. Bennyson NI, Programme Coordinator of Seva Kendra, thanking all the participants and delegates for their presence, said with the cooperation of the government officials he is optimistic about the project to bring a positive change to the farmers and the whole community at large.